With school boards having to cut budgets, field trips are often on the chopping block. 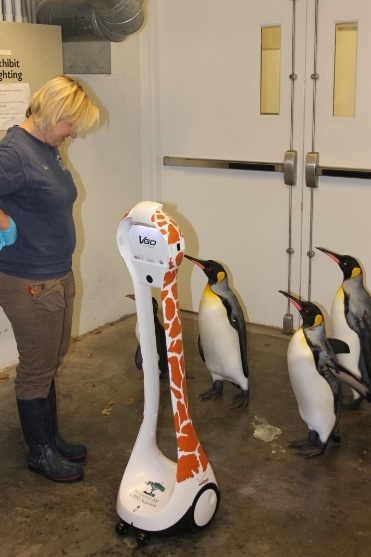 But with the VGo Robotic Telepresence Device, the Pittsburgh Zoo & PPG Aquarium is able to offer a field trip of the future. Mr. Taz Gebhardt’s second grade class at Guy K. Stump Elementary School recently participated in a remote field trip to the Pittsburgh Zoo using a VGo robot. They were one of the first schools in the nation to experience this unique opportunity. The Stuarts Draft, VA students enjoyed a program called “Wonders of Wildlife,” a very interactive experience led by Dave Mintz, Senior Education Specialist of Conservation Education at Pittsburgh Zoo & PPG Aquarium. A chinchilla, porcupine, macaw, and opossum were among the animals that the children were able to see, hear, and ask questions about. “We love hearing about unique applications for the VGo like this one,” said Ned Semonite, VGo Communications Vice President of Marketing and Product Management. VGo is most often used in healthcare applications as part of telemedicine programs, as well as for students with special health needs to attend class.